About a month ago, I received an email from a reader who wanted some advice for her struggles in paring down her wardrobe. She told me she hadn’t seen advice anywhere that fit her specific situation. I could have just responded to her questions via email like I usually do, but since I’ve been blogging for a few years now and have read many comments from readers, I knew many of you could likely relate to this reader’s challenges. I also believe that those who have overcome similar struggles in the past could offer her additional advice beyond that which I am able to give. So I decided to answer the questions in a post rather than through email. I will do my best to summarize the reader’s questions here, as her email was quite a few paragraphs long and I want to preserve her anonymity. This reader is an aspiring minimalist who wants to own less but finds herself with a closet full of items that she either likes or loves. However, she feels she owns too much overall, especially for someone who really wants to adopt a minimalist lifestyle. She is hesitant to store some of her items in boxes because that doesn’t feel “clean” or minimalist to her, yet she also doesn’t want to get rid of anything that is still in good shape and which may be hard to replace in the future. Compounding the issue is the fact that she plans to get pregnant soon and worries that if she stops working for a while, she won’t be able to afford good quality business clothes if she gives up the ones she has now. Do you want a minimalist wardrobe? I know that most of us think our challenges are unique to us, but I’m guessing that many of you resonated with the last paragraph and were nodding right along. Many of us want to be minimalists – or at least more minimalist than we are now – and many of us worry about getting rid of things and later regretting it. So I’m going to give my best advice to this reader and others with similar challenges, and I hope that others will also chime in with their helpful tips on this topic. I will start by sharing some of my personal story. Those who have been reading this blog for a while may be familiar with what I’m about to share, but it may be new for many of you. I started this blog in January 2013. At the time, I had 272 garments and 55 pairs of shoes! Shortly thereafter, Courtney Carver, the creator of Project 333, dared me to take on that challenge and I accepted it. I wrote about my fears and how I planned to address them in a guest post for the Project 333 blog. I had no idea how I was going to wear only 33 items for three months, let alone select those items from my burgeoning wardrobe. But I did… It took me days of painstaking analysis to make those selections, but I did it. I mostly stored everything else away, although I did get rid of a small number of items that either didn’t fit well or were past their prime. I thought I either liked or loved everything else in my wardrobe, as well as my 33 items for Project 333. But as the challenge went along, I started to feel differently. My standards started to increase, especially as I wore my 33 items more often than I had ever worn my almost 300 items before the challenge. Interestingly, when we only wear our clothing a few times per year, our expectations of our pieces are much lower. Things often seem good or even great when they are on the hanger, but do we truly love these items on our bodies and as we move through our day-to-day life? My experience was that I didn’t love nearly as many pieces as I thought I did. At the end of my first term of Project 333 (I did another stint of that challenge in early 2014), I was able to let go of a lot more items. I learned that I didn’t need as much as I thought I did and I felt less anxiety about having enough (see more of what I learned here). Over time, I have found that my standards for my clothes continued to increase and my tolerance for having a smaller wardrobe went up as well. I didn’t start out wanting to be a minimalist and that still isn’t my primary aim. I mostly just want to love what I own and wear all of my pieces more often. I am gradually meeting that goal more and more as time goes by. So that’s a bit of my story, which hopefully will be of some help and comfort to my reader, as well as others who struggle in similar ways. But I would like to offer more advice regarding her specific challenges. She mentioned that hiding clothes in a box doesn’t feel “clean” or minimalist to her. I understand what she was trying to express, yet that is exactly what is recommended to those who embark upon Project 333. Courtney Carver specifically states that those doing the challenge should box up the clothes they’re not using and store them away for that three month period. When it’s time to switch out the capsule wardrobe for the next season, that’s when participants go through the boxes and decide what stays and what goes. They get to see what they missed and what they feel they can live without. It may not feel “clean” to have these boxes of extra clothes in your home, but it’s part of the process. Over time, the boxes become fewer and fewer, such that Courtney now maintains just one small box of out of season clothing. While I still have a lot more clothes than Courtney and other true minimalists have, I have been able to pare down quite a bit over time, too. All of my clothes now easily fit into my closet, whereas before they spilled into a second closet and under the bed boxes. I feel it’s important to mention that all of the clothes I have culled were things that I felt I liked or even loved at one time. I just raised my standards such that what constituted an “8” or higher is now much different than it was before. I would love to get others’ thoughts on this topic, as I suspect many out there have had similar experiences, regardless of whether or not they’ve ever done Project 333. There’s nothing wrong with holding on to clothing we might need at a later date, such as business or special occasion wear. But I think it’s important to go through these items regularly (at least once a year, if not every six months) to make sure they still fit and are still in line with our personal style aesthetic. If one has a baby, of course the old clothes won’t fit for a while, so it’s not necessary to try everything on while your body is in transition. Yet the second part of the process is still important for everyone, going through your “just in case” items regularly. Look at all of the clothes you’re keeping on hold and ask yourself if you would still want to wear them to a professional job or formal occasion. If the answer is no, there’s no use hanging on to most of them. You might want to keep a few pieces so you’re not left high and dry should a last-minute event come along. But the best approach is to only keep garments you love and would look forward to wearing. If you have an adequate number of such pieces, why hang on to ho-hum items that don’t make your heart sing? My reader also expressed concerns about culling her wardrobe too fast and potentially regretting letting certain things go. One way to get around this concern is to have a “hidden holding zone,” a sort of weigh station where clothes stay for a certain period of time before heading out the door. I think a month or two is a good timeframe for pieces to reside in the hidden holding zone. At the most, I would recommend keeping things in the hidden holding zone for a season. In that scenario, you would go through your seasonal wardrobe at the beginning of that season, separate out what you’re considering letting go, and put those items into the hidden holding zone (which can be an alternative closet or boxes that you store out of sight). At the end of that season, you review those pieces again and determine whether or not you want to keep them. During the season, if you find you miss an “on the bubble” item, you can easily retrieve it and wear it again. What has helped you through your wardrobe purging challenges? What advice do you have for those who want to downsize but worry about doing it too fast or not having enough of what they need? I invite you to contribute your experiences and suggestions in the comments section of this point. I’m sure you have some helpful tips that I neglected to mention (or just might not know about). Many thanks in advance to all those who share their words of wisdom! Quickly separate anything that is totally out of season that you will not wear right now e.g. woolly sweaters when it is high summer. Anything that you layer and wear trans-seasonally can stay. We are only dealing with the no-brainers here. Later you are going to lovingly pack away this pile of out of season stuff in a box or drawer. Now is not the time to cull it. You will make better decisions in the appropriate season. As you go, pull out anything that is torn, tatty, stained or otherwise obviously past its best, or which needs repair. Chuck out the first lot and put the rest in the hall or your car to take to the tailor or the shoe repair shop. If you are like most women, culling by season, fit and condition will radically reduce the amount of clothes in your closet. This is your core working wardrobe. Every piece in it should be theoretically wearable right now to walk out the door. This simplifies decisions a lot. Once you have done this you will be able to see the gaps and duplications in your collection and assess which pieces you can’t do without, need more of, or which you can let go of. Great advice, not just for someone looking to downsize but also for those of us who live in places with seasonal extremes — this is a great approach to making good use of all those seasonal wardrobe changeovers. I also love the idea of a wardrobe that has “flow” and feels alive. Thx for the image! The most important and the hardest point for me was to clarify what I wanted to achieve with my wardrobe. You are so right Debbie, many of us think that we want to be minimalists – but it took a lot of research and soul searching to come to the point where I am right now. I want to have a curated wardrobe – enjoy the process and the outcome. Look forward wearing a certain outfit, have fun with different ideas – rather than feeling depressed and guilty about the excess of things and wasting money. I accepted that minimalist wardrobe is not for me- I enjoy beautiful things and that includes paintings, music, design, nature and clothes and accessories. I also enjoyed giving away some of my beautiful things to friends who appreciate them – like some designer pieces I acquired because I had a strong “need” to own some – even if they were not right for me. Debbie, the process was frustratingly slow, but I learned a lot from your journey and your books. You honesty helped me to be honest.When you will make it to Australia I am sure we will have a great time together. Because I have limited storage space I do a wardrobe changeover twice a year. Over the years I have found this a great help in keeping my wardrobe small. Some things you will still love when you get them out again but others will have you shaking your head wondering why you kept them. With clothing absence doesn’t always make the heart grow fonder. I think doing a stint of P333 or similar wardrobe challenge can definitely give you confidence that you don’t need as much as you think. I think that for a lot of us a fear of scarcity has us holding on to stuff that we know we should let go. For me the last piece of the puzzle was reading Marie Kondo’s book. Take everything out and handle it then decide what to keep, not what to get rid of. The difference is subtle but powerful. 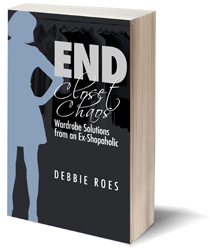 Debbie, when I first started reading your blog in April 2013, I had decided to cull my wardrobe after my best friend collapsed in laughter when she saw my closet, and then a few weeks later the actual rods collapsed from the weight of the clothes. At that time I had 579 garments. It has taken me over two years, but now I have less than 150 total. Today I can’t even remember half of the garments I got rid of in the culling process. 579 garments seems incomprehensible to me now. 1. I had too many colors in my wardrobe, some of which I never wore because they really weren’t flattering. I used the David Zyla technique to identify my best colors and made a visual chart of them. Then I went through and culled out things that were the wrong color regardless of the style. I realized that I always felt “off” when I was wearing unflattering colors, so why wear them period? 2. Next, I grouped together garments that were the same color for the purpose of comparing style. I discovered that I had redundant garments. I was able to cull through and pick out the ones that I wore, and earmark the rest for consignment or donation. 3. Of the pieces that I wore, I then evaluated them for currency of style. If something looked old, but I liked the way it worked for me functionally–then I set about to find its modern replacement. Some of my clothes at this time were about 7 years old, and the silhouettes/styles were dated, even if the clothes themselves were in good condition. 4. Lastly, after a garment made it through the previous culling steps, it had to be evaluated as to whether it really looked good on me. I saved this step for last because it seemed the most efficient way. The funny thing is, you THINK your clothes look good on you–until you really start analyzing yourself in the mirror critically. This is the point at which the last few hangers-on bit the dust. While I didn’t keep charts, I visually and fit analyze every piece that newly comes into my closet. I still shop, though not as much. I’ve come to find out that more garments are multi-seasonal than I used to assume. This is largely due to the types of fabrics being used now. While I don’t think I could ever have a 365 day wardrobe entirely, I have made great strides in selecting clothes that work in all seasons. Now when I shop, I tend to know beforehand what I am shopping FOR, rather than in the past when I shopped for the sport. I shop for a lot of my workwear at Ann Taylor/LOFT, because it’s decent quality, still youthful enough for my age, but fits my size 12/14 body decently, and I can usually get 2-3 years out their pants/skirts/tops. And what’s really great is they have good sales! Great advice, Debbie! I would add that it’s OK to become a minimalist SLOWLY. I started trying to cull my wardrobe in 2012 and am still going. Sometimes I feel like I have been the world’s slowest wardrobe purger but I had a lot of anxiety and difficulties letting things go. I am so very close to where I wanted to be, but even now I see that I could still go further as far as reducing my wardrobe. I did it in stages, although it didn’t seem that organized at the time – first, the “fat” clothes from when I was a size bigger. Then the clothes that were two sizes too small. I figured by the time I lost that weight (if ever), those clothes would not be ones that I would want to wear anyway, and I would want to buy newer, trendier things. Then slowly I worked on the “fussy” clothes/shoes and those that were a bit small. Now I’m working on getting rid of things that I don’t love. During all that time I also worked on what I wore to work and at home. I used to have very formal clothes for work, and very casual/sloppy clothes for home/the weekend. I have gradually merged my clothing so that I wear less formal clothing at work that can also be worn at home. Of course, I don’t wear sweatpants to work, but I try to look for clothing and footwear that is multifunctional. NOBODY at work has commented on me getting a smidge more casual. Plus, my family and boyfriend like that I am a smidge more dressed up at the weekend. Win-win. Moving from 960 square feet with 2 walk in closets, to 500 sq ft with one 3ft wide closet, forced me to drastically cull my wardrobe. And then I’ve done two or 3 more purges since then using a combination of P333, Konmari, and various other processes. I found that Konmari was the most efficient, because it’s as simple as “do you like it, yes or no?” No complicated formulas. I echo the recommendations that culling the wardrobe shouldn’t be done in one go, as you may end up regretting getting rid of something you later decide you wished you’d kept, or keep things you don’t actually like. I wish you luck in your wardrobe downsizing, and please remember to do it in the way that best fits your goals and ideals, not someone else’s ideals. I have used may of these great ideas listed above and want to add what I think may be a new idea. It started when I got a compliment on a top I was wearing. I thought about the difference between how we think we look versus how others think we look. We may not realize a piece of clothing is super flattering on us to other people. And isn’t part of dressing for them too? As much as I dress for myself in what I like, at work I have to portray a certain role. SO, now, when I get a compliment on a piece of clothing or accessories I put it to the front of my closet so I can wear it more. And once I had a few items that had been complimented on I looked them over and it helped me realize what colors and styles of clothing look best on me. Now I have an area for my most loved pieces and you’d be amazed how easy it is to pare down the rest of your wardrobe once you have the best items set aside. I am only currently wearing the same 14 outfits for the rest of the summer season and not only has no one noticed the repetition I in fact get compliments all the time now and it feels good when that happens. Just to sum up its not that I want anyone to dress “for” other people and lose themselves, but letting those compliments help show you what looks great on you that you already have in the closet! I’m thinking for August and September of trying to rotating the same 10 outfits (2.5 weeks worth with being in the office 7/10 business days). Since I’ve worn the same green dress to work 3 times in the past 10 days, with a different cardigan, and no one has said anything, I doubt anyone will notice. Imo minimalism sounds great on paper. Looking at people’s blogs and images of pristine closets online is great eye candy and all, but that doesn’t mean that minimalism is necessarily going to work better for you or make you any happier. I think minimalism is great for people who really don’t enjoy dressing up everyday and/or don’t really care to think about or have the energy to think about their image or style. They just want to get out dressing competently, projecting the image that they want to project, and left the house to get their day started. Others really want the creative freedom to dress everyday and use clothing as a creative outlet and a fun way to express themselves. The creative process brings them joy not necessarily the clothing themselves (although that can be a part of the joy). There’s nothing wrong with having beautiful things that you enjoy and get use out of them. This may require having more clothing options than those that like the more minimalists approach. I would store the clothes away, especially since this person is going to go through some major life changes soon. Your outlook and perspective will change so I would store everything and get back to them. Best thing is to do a major major closet CLEANING. Perhaps even a house cleaning. Get everything nice and organized and perhaps the desire to become more minimalist will change. I agree – there’s a big difference between having too many things, and those things being disorganised. As my wardrobe is becoming better organised (mainly through recording my favourite outfits on a spreadsheet) I feel less compulsion to throw loads away. Sometimes it’s a matter of developing a good relationship with the possessions; like everything else this takes a bit of careful thought and self awareness. In my case I enjoy very much combining colours, so would never survive with a minimalist palette, no matter how sophisticated they always look on blogs. The “hidden holding zone” has worked well for me as a way of overcoming the fear of getting rid of something that I actually want/need. I think that if you aren’t ready to just get rid of things in one fell swoop (and there may be sound reasons not to take that tack) you have to accept that the process is going to be a little messy, and that’s totally ok. This is not a new concept on your blog by any means but it hasn’t been mentioned yet in the context of this post, so I’ll say that the thing that has helped me most of all in overcoming that “fear of scarcity” has been wardrobe tracking. Writing down what I wear each day has really brought home the fact that we just have a limited number of opportunities to wear things, and it doesn’t take as many items as I thought to create the sense of variety that I crave. I use a spreadsheet for wardrobe tracking, and so when I’ve debated keeping/donating some of those “on the bubble” items I’ve been able to go back and look at how I’ve actually worn them. Often I see that I always wore the item in the same way, or I wore it in outfits that I am not eager to wear again, or I could easily substitute a more favored item and create pretty much the same look. I’ll start by saying that I have issues with keeping too few things in my closet and read Debbie’s blog because the same discussions that help over-shoppers can assist under-shoppers as well. So I would just advise being careful and going slowly since purging can release similar endorphins as shopping and create false feelings of being in control. Of course you may have so much that some purging is warranted and will create better flow in your life. I would also look into your reasons behind your aspiring closet minimalism. If it is to make getting dressed easier, then having extra items in storage to fill in gaps as things wear out is perfectly valid. If it is to have a smaller environmental footprint, then I would suggest the same. Store clothing that is extra until needed. And if this is part of a greater season of transition, then I would go slowly and box up clothing in lifestyle categories and only keep what works best currently in your closet. And while Debbie has lots of people giving her feedback on her closet due to her blog, thank goodness there is no one keeping score in most of our real lives. In other words, don’t worry too much about being “clean” as a minimalist since it’s a sliding scale anyway and the rewards are internal when you find your closet set point. I can relate to everything Jen W said! I often feel guilty that I have “too many” things compared to minimalists, but “minimalism” is in the eye of the beholder. I sometimes fall into the trap of thinking that if I just get rid of a few more things, my wardrobe/life will be in control – which, of course, is ridiculous. Also, the minimalists I compare myself to are usually in very different circumstances than me: one lived on a farm (I’m a city/ suburban girl), many work at home (I work in various office/academic environments), some live in temperate climates (4 extreme seasons here), etc. Plus, if you purge too much – and I’ve done this – then you end up purchasing replacements. Reading some blogs, I suspect that some “minimalists” spend more money overall than some people who hang onto things longer and have more at any one time. 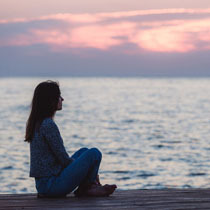 For me, the “hidden holding zone” has helped me not to make rash decisions, and just allowing myself to feel grateful for all the pretty things I have has made me calm down. Really, as long as you wear and appreciate what you have, if you are not in debt for it, and if you have space for it, why torture yourself looking for a “perfect number” that might not exist? You know, I’ve actually become “addicted” to minimalism… It’s a little crazy. I love looking into my sparse closet. But, now I’m ridiculously picky about every little thing I bring into my home. It has to be PERFECT. And, I’m afraid perfection is an impossible goal. Ugh…. I must find the balance! On another note, do you think you could address the issue of over-shopping & chronic returning on a blogpost someday? In my quest for perfection – and my need to fill the “void” of shopping less – I have actually found myself shopping MORE in hope that I’ll find that perfect whatever it is I’m looking for… And, of course, this leads to continuous boxes in the mail followed by trips to the mall to return almost everything I bought. *shame* It’s a crazy, vicious cycle & I want desperately to stop. So, anyways, I’d love to see you address this on your blog one day. Dear Ex-shopper, I did relate to your comments on perfectionism and the anxiety-producing cycle of always looking for that perfect thing that is just around the corner. How often have I purchased a classic item like a black jacket thinking ‘this is THE ONE!’. I will wear this black jacket forever!’ Only to find through wearing it that it is not quite the right fabric, or proportions, or doesn’t go with the things I was so sure it would go with.Gretchen has addressed this very topic http://grechenscloset.com/minimal-closet-perfection/ and you might find further hints in her minimal closet posts. 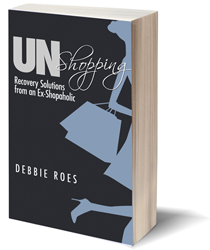 Debbie’s friend Jill Chivers also has archived posts on shopaholism which are very useful. I am also a great fan of Flylady whose topic is housework, not clothes shopping. However, fighting our perfectionism is a key theme of hers. I often have her gleeful slogans in my head as I whizz around doing a quick and imperfect tidy: ‘A job done badly is still a job done!’ and ‘Just the middles!’ (re vacuuming)! I agree with all of the suggestions offered (wonderful comments!) and within the past five years I’ve incorporated just about everything that has been said here in order to reduce the amount of clothing that was in my closet, and find the balance that is right for me. For anyone who considers herself an aspiring minimalist who wants to own less but finds herself with a closet full of items that she either likes or loves, clearly it’s going to take a bit of time in order to begin to decide which clothes to keep. Pregnancy, along with the first couple of months after giving birth, offers an ideal opportunity to do Project 333 and begin to decide if a minimal sized wardrobe, or a minimal inspired lifestyle, is the end goal. Give yourself the freedom to explore without any rigid and hard rules. My wardrobe is on the small side, and over the past few years I’ve also reduced the amount of items owned and stored within my home. Yet for me it’s all about wanting to have everything fit comfortably within my closet and existing space in my house and garage. I don’t like living in an environment that is filled to the brim with things I seldom use, or never use, because then it feels to me there isn’t any ‘chi’ and flow. I consider myself to be minimal(ish) or moderately minimal and I use the term loosely, with plenty of wiggle room. Because of the crap quality of clothes in stores these days, I have become a minimalist, unintentionally. I love and wear everything in my closet for years, and years, but if I want to buy something new, it has to be a natural fabric. Cotton, linen, silk or wool, at least 70% of the fabric has to be a natural fibre. And it has to be in my very tight deep winter palette – white, grey, black, light blue, navy, burgundy, plum, red, maybe purple. No polyester, rayon, viscose or whatever else it is they have out there. With the remaining 5%, all I ask is “Will it fit “? Next is “can I afford it?” If the answer to both is yes, I will buy multiples and wear them for a long time, until they are torn or stained. I have to look online or in thrift/consignment stores and that ensures that I take good care of what I have. Every year, I replace a couple of lounge wear items like t-shirts. And I’ve discovered that I love white. 70% of my tops are white. It suits me, plus they don’t fade and the main reason I have to get rid of cotton clothes is fading. Whites are easier to keep clean too. Google Dawn dish soap + hydrogen peroxide. Takes out every stain you can imagine and my whites stay white with my DIY detergent. I’d rather pay $50 for a dinner than a top . So that makes me a minimalist, not by choice, but in the way I function. A few years ago I had a major career change from f/t “power” executive (with matching suits) top/t consulting and “semi-retired” work (gets me out of the house). I went through a significant cull and still use same techniques to keep my current wardrobe fresh and in good repair. First I started by further limiting my already limited color palette. (I have a modified “winter” color palette, and I eliminated some colors that were “fun” but not essential to a well-coordinated wardrobe.) I also refined my wardrobe stylistically from “executive” to “creative and business-like. Good-bye matchy-matchy suits, hello skirts/pants/”soft” jackets and cardies. Good-bye more “formal” shoes, purse, briefcase, and stuff like that. Interesting enough, I had very little to cull from this round as most of my clothes were “classically feminine” and thus moved easily to a somewhat less formal work-a-day world. I also got rid of nearly everything that could be a “multiple” (with a few exceptions — more than one pair of black pants, more than white blouse). A lot of my clothing can stretch over more than one season (and were bought to do so). I have a few “hot and humid” clothes that appear in the summer and a few “cold and blustery” clothes that appear in the depths of winter. 80% of more of my clothing gets worn year round — and it was purchased with the goal that it would do so. I also asked myself, “Would you grab this is you had 10 minutes to pack a bag and evacuate for a fire or __________ [fill in natural disaster].” Boy, you can really make decisions about clothing really fast if using this test. I found that, except for a few basic things (undies, sturdy shoes, a few changes of clothing) I would chose to save lots of stuff instead my clothes. So as I have replaced/freshened/updated my clothing I have: maintained a limited color palette; maintained a specific style of clothing; purchased clothes that can work for more than one season wherever possible; and eschewed multiples. I wouldn’t say I am a minimalist but I do have a very small wardrobe — about 125 pieces including outerwear and undies/sleepwear. Reading the summary of the question I feel that the reader has all the reasons to keep her clothes (she either likes or loves them; they are in good shape and which may be hard to replace in the future; getting pregnant and potentially won’t be able to afford good quality business clothes after stop working for a while), and no good reason for culling other than” aspiring minimalism”. You need to have better reasons than just that to purge your clothes (maybe you do but didn’t mention). I think Debbie said she started with a dysfunctional wardrobe filled with impulsive, sale or consignment buys that are fussy, not her color, not fitting well, not flatting or of sub-par quality. Through two years of hard work learning her style and trial and error she became her own version of minimalist – Her clothes make flattering outfits and she wears all of them and feels good in them. She found freedom from overwhelm and guilt, and no longer trapped in consumerism, to me that’s the spirit of minimalism. Everyone has their own interpretation and the point is, it is about freedom, not numbers. If you fret so much about what to purge, then maybe you don’t need to. Also, it takes time, money, and energy to buy clothes, and what’s shiny and new may not be better than your tried and true. Meghan makes some very good points! I wonder if the reader already has a great closet full of clothes that suit her, and has a pregnancy planned, for which she will inevitably have to buy new clothes in the future, that what she needs right now is not a cull but a shopping fast. I am imposing this discipline on myself not only because I am pretty sure I have enough clothes but also because I’ve overspent. Inspired by Debbie, I started to track my purchases and last year was shocked to find I had spent $9000 on clothes and shoes, at least $1000 of which were mistakes. This year I budgeted $2500. As I managed to spend this and a bit over by June (! ), I am now on a shopping fast for the rest of the year. So far, so good. It is a test of making the best use of what you’ve got, which is the essence of minimalism. I’m the reader on which this blog is based. First, I’d like to thank Debbie heaps for the blog and all the other readers for their comments!! I think Win is right about me having too much because I’ve overspent. Earlier in my life I was not into clothes, couldn’t have cared less. My dad was worried because I’d just wear jeans and a tshirt. It was later than most females that I became interested in clothes and then it seemed to be something I went overboard in trying to perfect. I worked out my colours, which fabrics I like (natural and soft), what shapes and cuts fit me best, etc. I didn’t buy because I found it on sale, if I saw something I wanted I’d either wait for the sale or buy it full price. My wardrobe is down to all the right colours, fit, fabrics, etc. Everything else has been given away. This is the point I’ve become stuck at reducing. I think I was buying too many of items that suit me because I bore easily and like finding the new, and as a secondary lesser reason I think some things I like but probably ‘settled’ for and am still hunting for that ‘perfect’ one I haven’t found. I’m also afraid I’ll bore with having too few items. As for why I want to be a minimalist… I have been a neat person and an organiser my whole life. Nights, weekends, even as a child I would clean and reorganise my room, my cupboards, drawers, etc. Most weeks at some point I’d be rearranging, tidying, finding the best storage options, always had my things where I’d know where absolutely everything was, etc. I liked doing it, it was and is fun to me to clean and organise to make things better but I never felt satisfied with what I had done for very long. I started to realise what I wanted was to have empty space left over and I was never achieving that. Reading KonMari’s story of growing up sounded so familiar to me and I could really relate. I don’t want to spent so much time organising because I haven’t gotten the empty space, I want to do other things. I have been battling an entrenched desire for empty space against a full closet of things that suit me because I have bought too many. I think I need to find a way to not be bored by what I own, to still the need to seeking more or find those ‘holy grail’ items. Thanks everyone, I find hearing from others on this to be useful and I think recovering from being a shopaholic, aka this blog, is where I need to be! There might be other reasons to cull other than aspiring to minimalism. A pending move, career change, conversion of extra bedroom/closet space into a nursery, etc., are some possible reasons someone might want to downsize a wardrobe. I like looking at all my clothes in one closet (arranged by color and sleeve/pant length) — it reduces the hassle of trying to find the right top for the pants I plan to wear, and so on. I don’t store anything but woolens in the summer to avoid moths.) So why I’m no way a minimalist, I do have a small wardrobe compared to many people. I agree with Deborah(Deby) on out how important it is to know “your” colors and your personal style and body shape, and lifestyle (the one you actually have) as a precursor to any culling process. Otherwise, how can you decide what to cull. Another way to tackle “right-sizing” a wardrobe is to sort clothes into: a) basics (good pants and skirts, good tops/jackets/sweaters, and so one. I call this “Tier 1” and for me these are all high-quality solid color items that I am willing to spend some serious coin on. In this tier all my clothes are black or charcoal gray. Then create: b) a secondary group of clothes that augment and coordinate with the first group (Tier 2). For me, this is where a lot of my classic patterned (stripes, polka dots, checks, animal print, etc.) clothes go as well additional colors like red, blue, white, and so on. I still look for quality in this tier but I tend to also look for bargains and well-priced clothing. Finally c: Tier 3 includes accessories, fashion-forward clothes, patterned clothes that seem too trendy for Tier 2. I generally spend the least amount of money for individual items in this tier. (Expensive jewelry of other accessories for me goes in Tier 1 or 2. This means for me that these items have to “classics” and their shelf-life will extend over many years over even decades.) Tier 3 clothes get replaced a bit more frequently than the other tiers, but I do a periodic “style” check for all 3 tiers because even “classic” clothing can become dated and/or worn-out looking. Like some others above, I live in a very seasonal climate, and find doing this seasonally is the best way for me. I’ve developed a very simple method. I use 4 seasons, and at the start of the season do a re-shuffle, taking out things that have been tucked away and storing away others (everything’s in one wardrobe, but some thing are more difficult to reach than others, e.g. on high shelves or hung inside winter coats). As I go through the three months, whenever I try something on and don’t like it, it goes into a holding zone, and then at the end of the season if it has not been retrieved I consider throwing it away. I’m aiming to gradually shrink the total number (I like my clothes, but hate clutter and I have far too much stuff! ), so the target is to throw 5 more than I buy each season until I get to a point where it feels ‘right’ to me, in with case I will switch to ‘one in one out’. – this also has the effect of making me think twice before buying a new item – is it really better than what I already have? ps – if there is nothing or not enough in the holding zone I would then look at what hasn’t been worn, but should have been (e.g. shorts in the summer) and consider why not, do I really need them? I want to thank everyone who has commented on this post SO much for adding your perspective on this very important topic! I knew when I decided to feature this reader question that a lot of additional helpful advice beyond mine would be added. I have learned a lot from the comments given here and I know others who have read them have, too. In fact, I think these comments are so excellent that I am going to feature many of them in a follow-up post. Many readers do not read comments and I think that what has been said here is so valuable that I’d like ALL readers of the blog to benefit from it. Stay tuned for the follow-up post to go live soon. Again, thank you all SO much for what you have contributed here! And if your comment isn’t included, please don’t be offended. I probably won’t have room to include them all, but I will recommend that readers who want to learn more come by and check out all of the additional comments. This is a great community and I feel blessed to have such knowledgeable and thoughtful readers. Thank you for your support of me and each other!